The infamous Long Island house is now occupied by a group of phony clairvoyants, who make their living doing faux seances. Once they are exposed, the house is quickly put on the market and it is bought by the reporter (Tony Roberts, Annie Hall) who unmasked the scammers. The journalist is convinced there is no such thing as a haunted-house, but it doesn’t take long before he realizes that the house is indeed haunted. 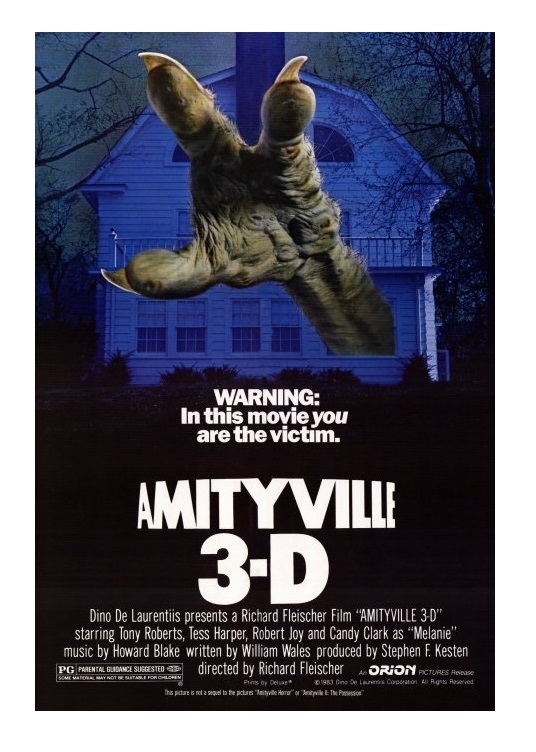 Hey, I know I’m in the minority, but I really liked Amityville 3-D (the flat version was retitled Amityville 3: The Demon); it’s my favorite film of the series. Issues with the silly ending, and cheesy 3-D effects, notwithstanding, Amityville 3-D, directed by Richard Fleischer, is suspenseful, believable and goodly entertaining. I enjoyed the way writer William Wales has fun with well-known horror film clichés. Amityville 3-D doesn’t feel like a mere rehash of the previous films either — the old chestnut gets a new coat of varnish. Veteran filmmaker Fleischer’s (Disney’s 20,000 Leagues Under the Sea) work is simple and efficient. He falters a bit during the film’s climax, but Fleischer keeps the film grounded in reality as much as possible and that helps a great deal. Tony Roberts is very good in the leading role. Tess Harper (Tender Mercies) plays Roberts’s unsuspecting wife. Candy Clark (American Graffiti) has a small role as Roberts’s co-worker. Lori Loughlin (TV’s Full House) plays Roberts’s teen daughter. Pre-stardom Meg Ryan (Innerspace) appears in a supporting role. Lalo Schifrin’s chilling score is sorely missed, but composer Howard Blake’s (The Duellists and The Lords of Discipline) new score is an acceptable substitute. The shots intended for 3-D are not too distracting. While the FX-laden finale seems to belong in another film, Amityville 3-D (1983, aka Amityville 3: The Demon) is a nice haunted-house film that fans of these types of movies will enjoy. Even without the 3-D glasses, the third chapter is fun – it’s the best of the sequels. Color, 93 minutes, Rated PG. I’m always hesitant to spend time watching cheesy sequels, but your review has me intrigued. Thanks!